Patea PNG Quilt Collective: August 8 - One quilt from Gina. August 8 - One quilt from Gina. This is long overdue! I have a huge stash of fabric to use just for baby quilts, but as always, finding the time to make them is the most difficult part. This one is made using cotton sheets from an opshop, cut into strips which are sewn together then recut to form four patch blocks. I've used some nice thick wadding found in an opshop, to fill it, and brushed cotton for the back. 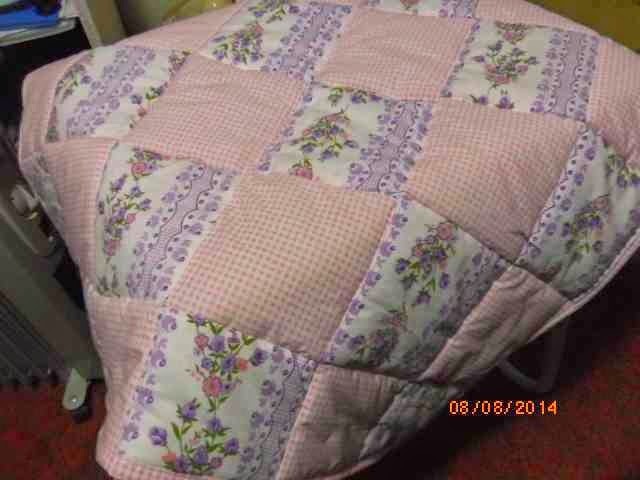 What a cute quilt,and a great way to shop for material, I really should op shop more often!! August 15 - Two more quilts from Gina.